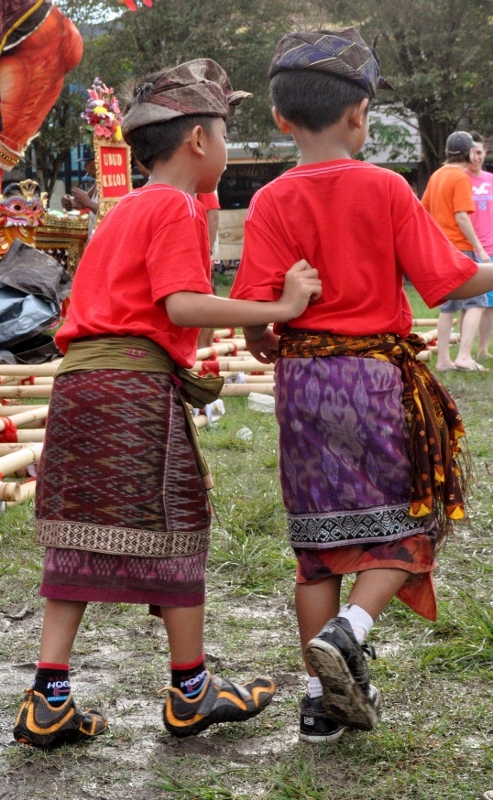 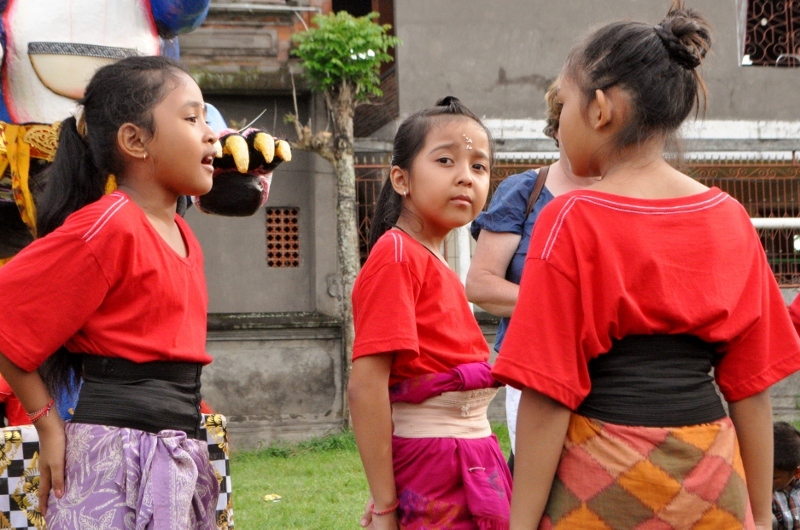 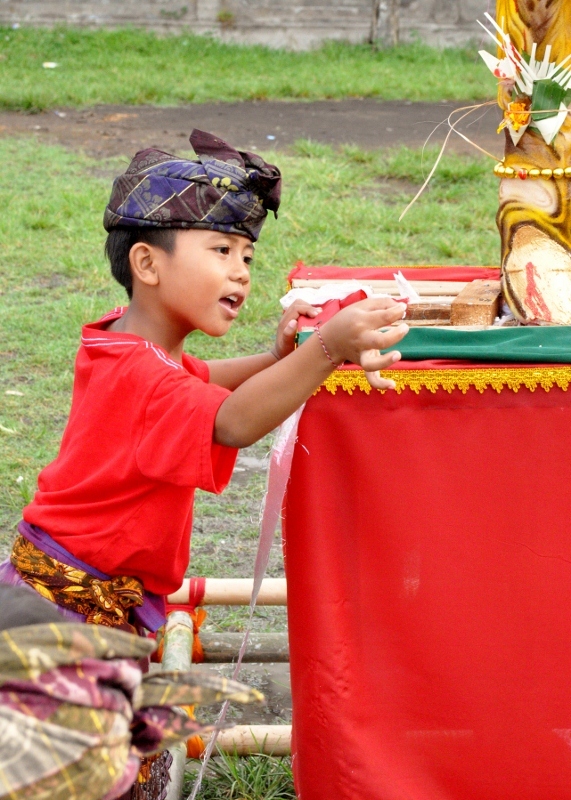 Continuing with our look back at our time in SE Asia, here are some photos from Nyepi. 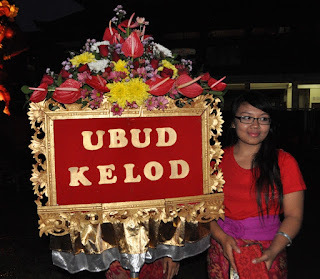 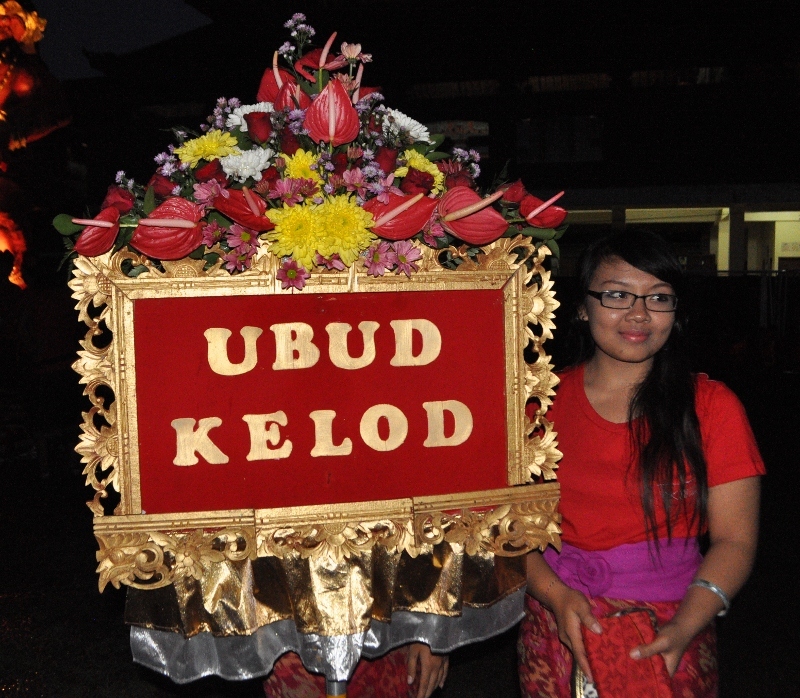 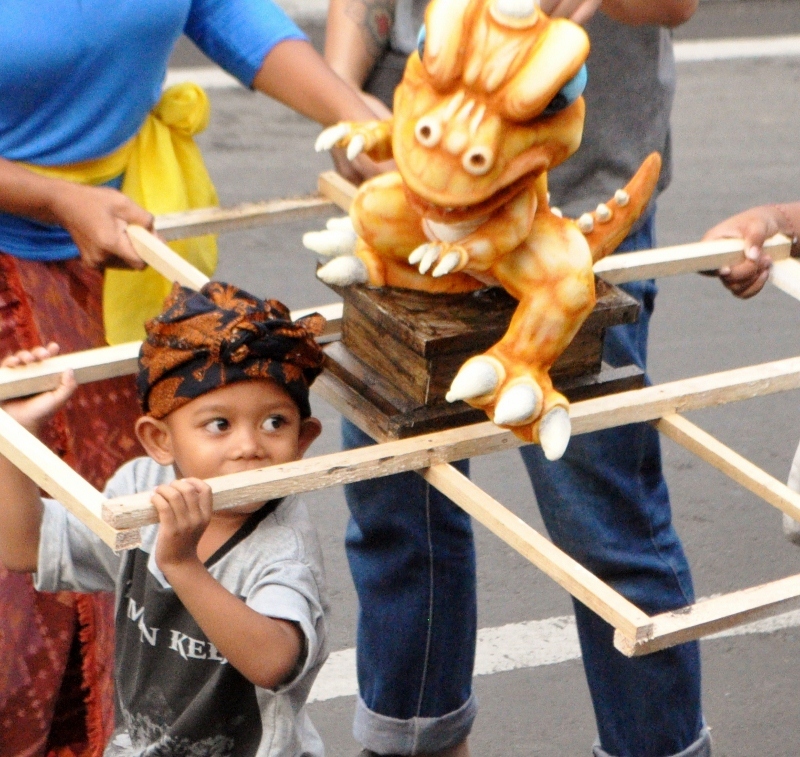 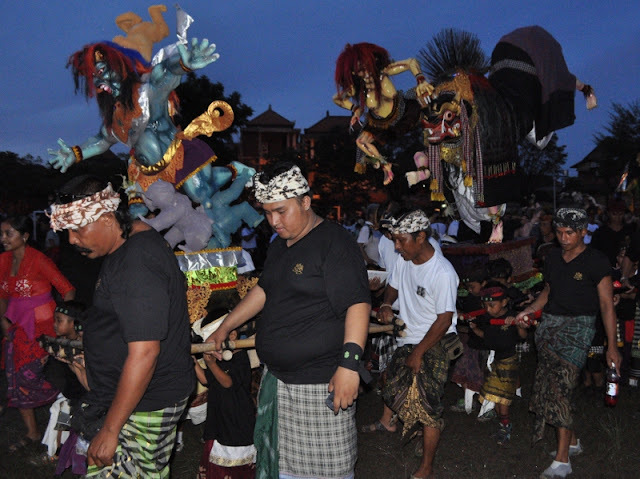 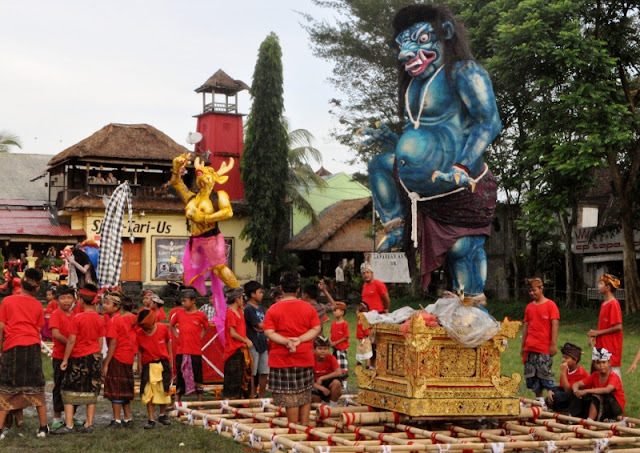 Nyepi is a celebration of the new year, according to the Balinese calendar, and fell in March in both 2014 and 2015. 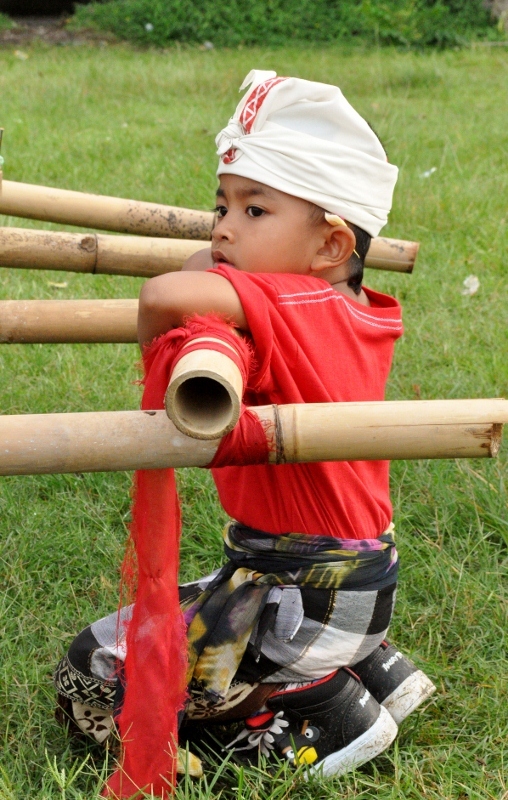 It is a many-day celebration that includes various rituals, parades and colorful costumes. 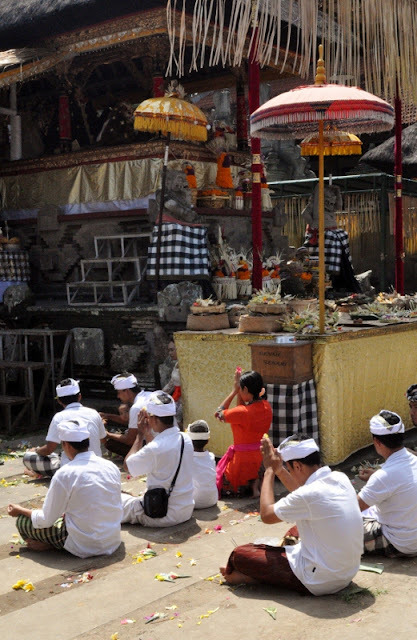 In preparation, villages and streets are cleaned, and offerings are made to gods and ancestors. 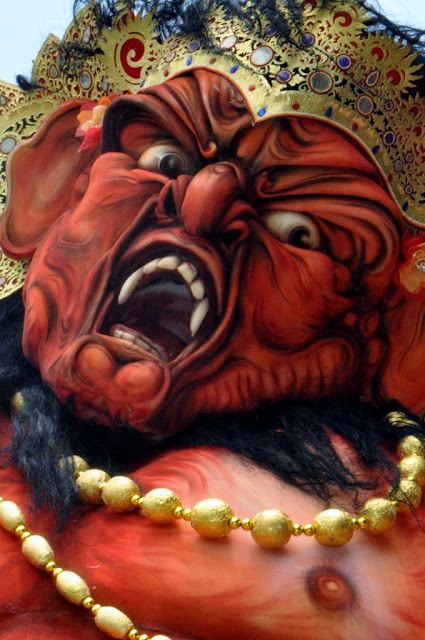 Rice is used frequently and abundantly -- placed on alters, on faces, in the streets. Women carry tall baskets of food and fresh fruit on their heads; children don their village uniforms and play a central role, too. 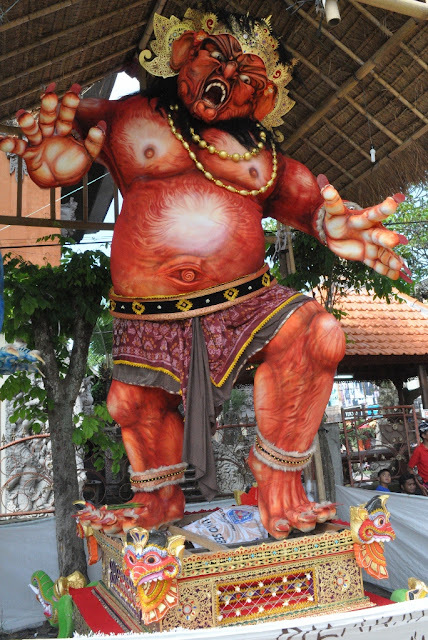 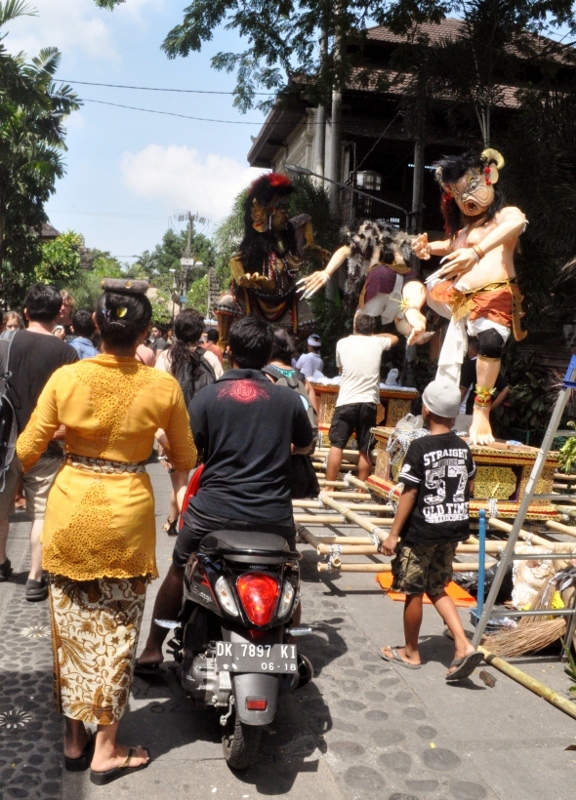 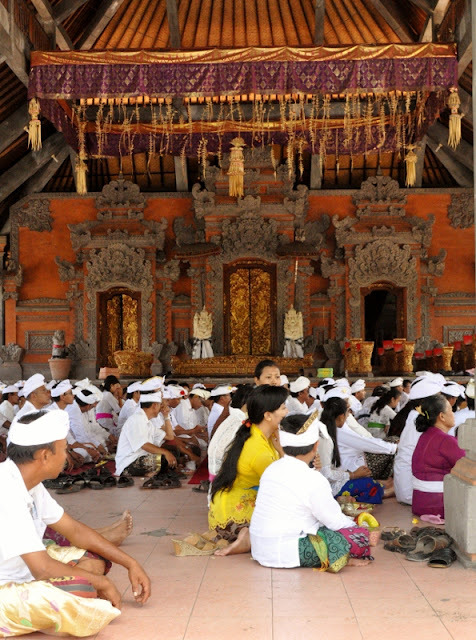 On the day of Nyepi, all of Bali turns out for solemn prayer at temples and parades to chase away demon spirits -- usually lurking at crossroads. 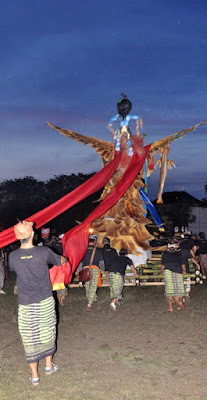 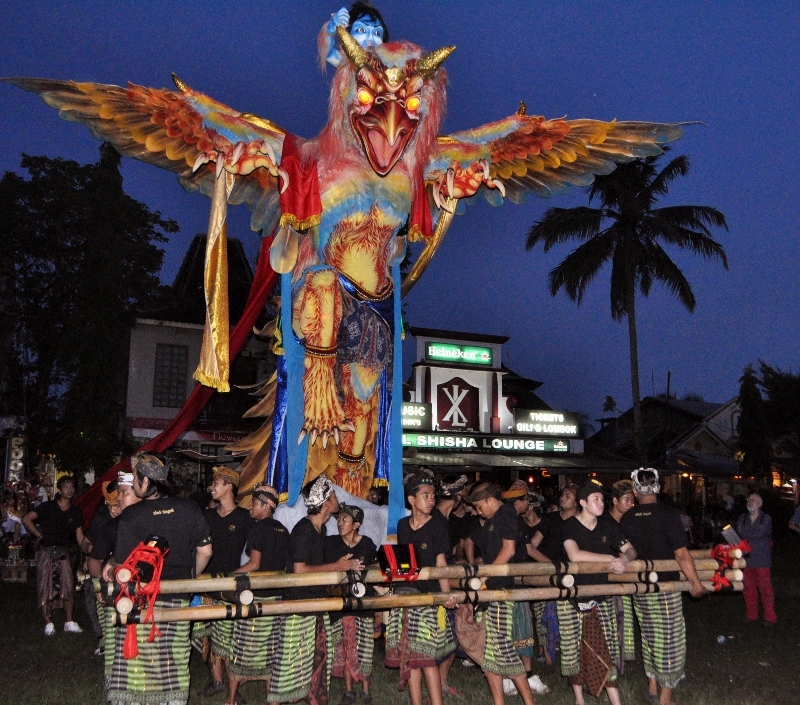 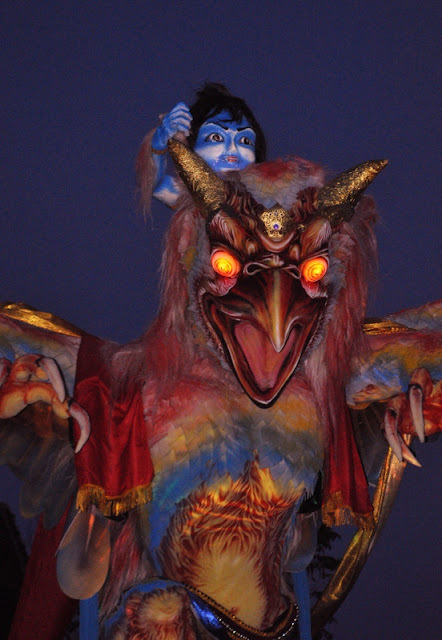 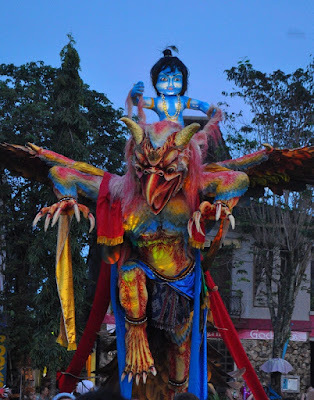 Huge effigies of great monsters and demons are made of paper mache, flax and other materials and decorated lavishly; then, they are displayed on large floats made of bamboo scaffolding and supports, carried at dusk through the streets. This was our favorite part of the whole celebration: like Mardi Gras, Balinese style. A spectacular sight to behold, and a celebration with good cheer and powerful vibes. 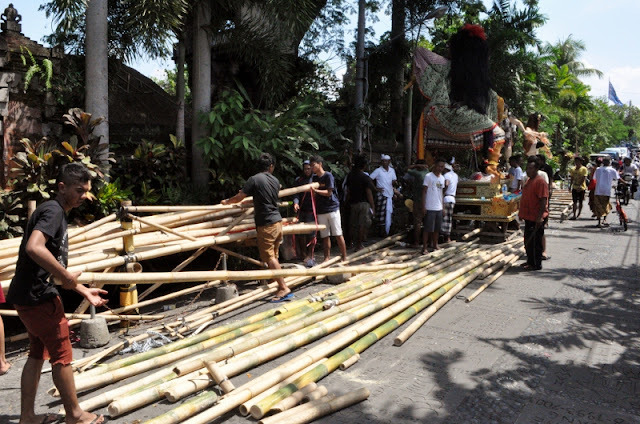 We were in Ubud for Nyepi, and we took a day of rest, like the rest of Bali, from our engine work. 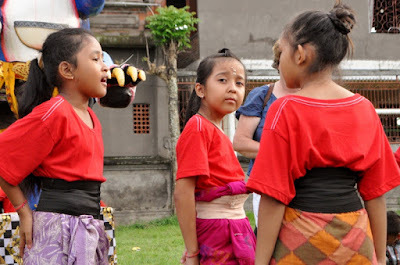 We left Serangan Harbour and ensconced ourselves in a small guest house and enjoyed being in the heart of the celebration. 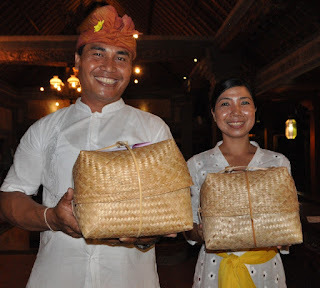 A day ahead of time, we ordered food from a local restaurant, whose cooks put together gorgeous packets of fresh foods wrapped in banana leaves and placed neatly in hand-woven baskets (below). 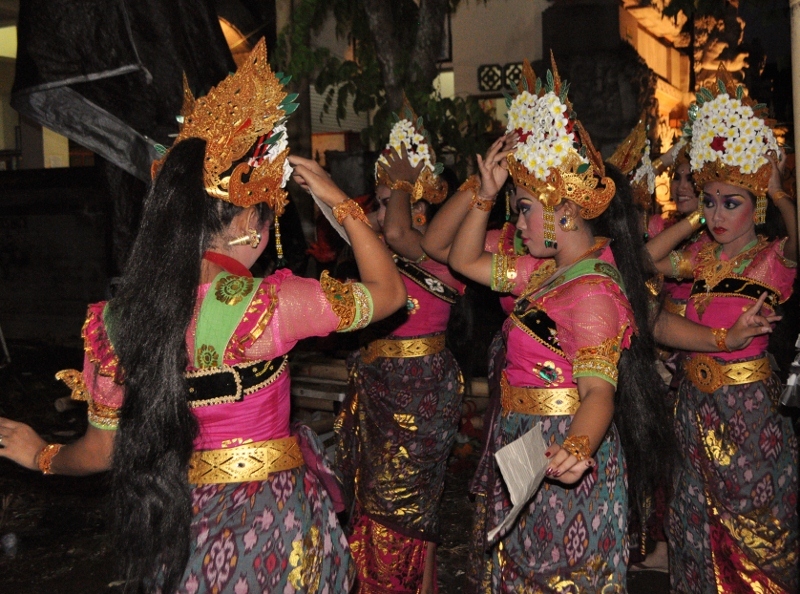 The food must be ordered ahead of time, as once nightfall comes no cooking or any work of any kind may be performed. 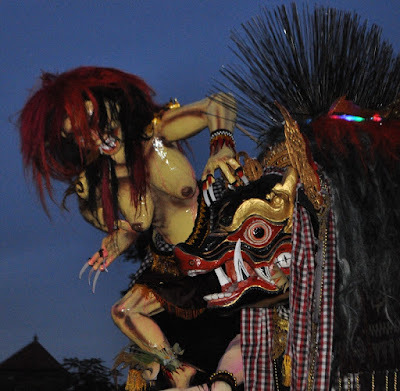 On the night of Nyepi, the power is cut, and Bali spends 24 hrs in silence. 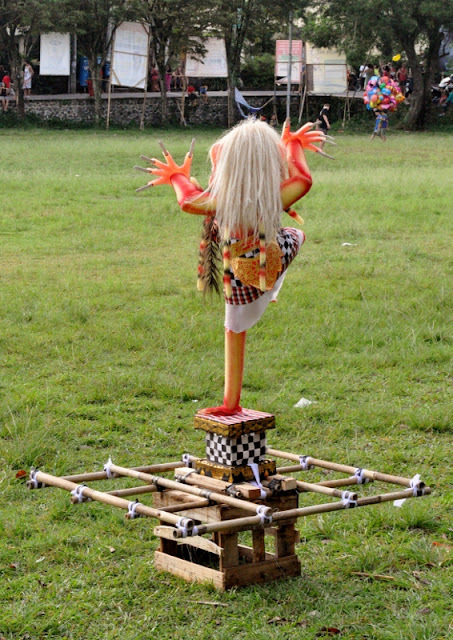 No one uses any appliances. 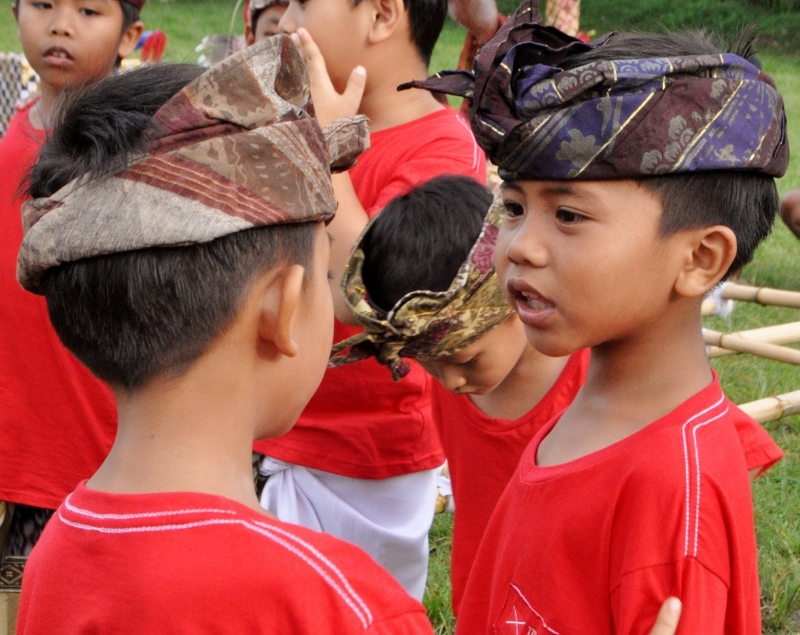 No one speaks. 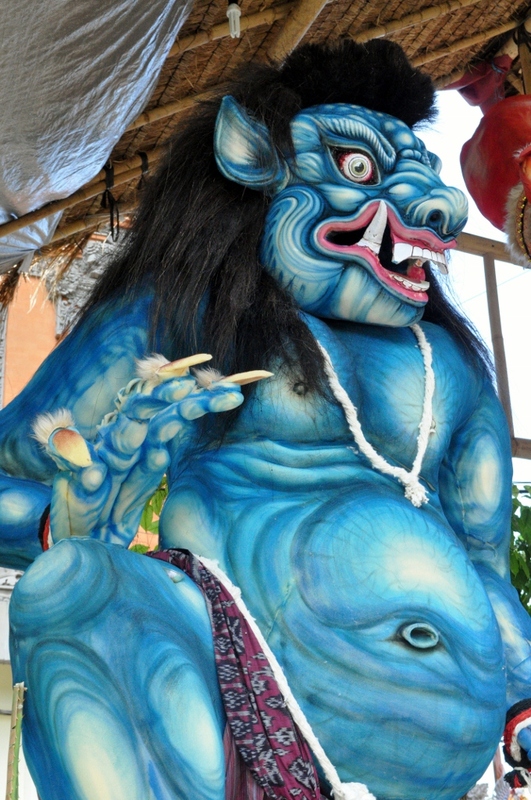 All energy is focused inward,while the silence also encourages the demons flying overhead to miss Bali and fly on to another island. A pleasant way to welcome the new year: a day of quiet, spiritual cleansing, with the happy knowledge that the evil spirits will be going someplace else for the remainder of the year.